I was given this book for review. The opinions are my own. I have read other books by Robert J. Morgan and found them to be very enlightening, thought changing. 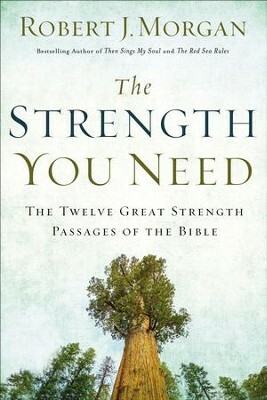 I read the Red Sea Rules first, then Live More Worry Less and now The Strength You Need. I have enjoyed each of the books. They each affected me on so many different levels. I found when I was in a tough spot when I couldn't walk when I was dependent on a wheelchair, a walker, I continued reading the books. When other challenges came, the not knowing if I had bone cancer, if I had a more severe form of my bone disease I was dealing with again the books affected me on so many levels and drew me in closer to God, taught me to press in harder, lean in on Him. These books seem to have been brought into my life just at the right time, I needed them. When I needed the strength to go on. I am glad that I had the opportunity to review these books, but also to be able to add them to my home library and have them available for others that may need them.